If you know me, even just from reading this blog, you know I have loved horses since I was a child. I rode hunter/jumpers for many years until my bone cancer diagnosis and surgery replaced my femur with titanium. One of my jobs before my diagnosis was exercising race horses. Despite not being able to ride anymore, these four-legged amazing creatures are still my favorite animals. When I was in junior high my interest expanded to horse racing. I read books on Secretariat, Man O’ War, Ruffian, Affirmed, Seabiscuit and other great horses. I started following horse racing on television, newspapers and magazines (before the internet was a household product). I loved that my papa would start following horses on the road to the Kentucky Derby so we could share our opinions on which horse might win. On the day of the Derby, he would call me from Kentucky where my grandma and he had retired to discuss our picks. I watched the coverage and race on television with my parents, then Papa would call to either congratulate me or discuss the horse who upset our picks. I loved these moments. The Kentucky Derby is the longest consecutive running sporting event in U.S. history (since 1875), known as the “fastest, most exciting two minutes in sports.” Held for three-year old Thoroughbreds, it is the first jewel of the Triple Crown, three top races that also include the Preakness Stakes and Belmont Stakes. The Derby is one of the greatest, if not the greatest, race to win. 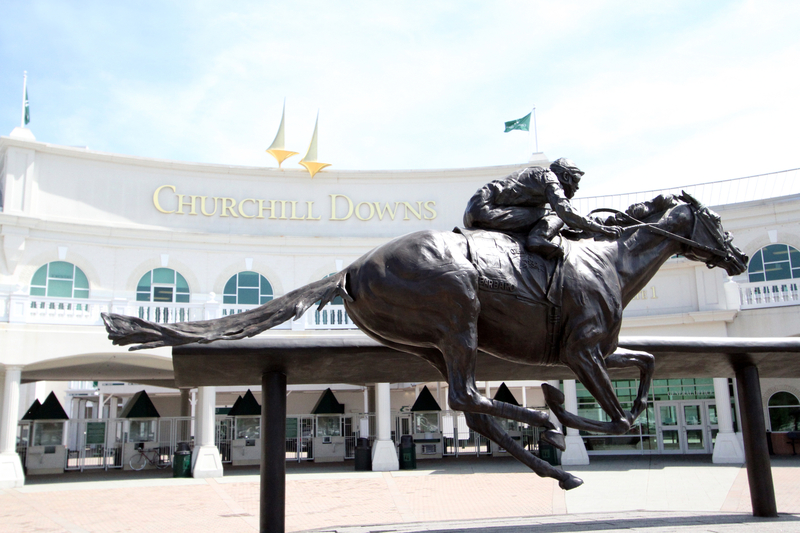 It is held the first Saturday of May at Churchill Downs in Louisville, Kentucky. It made sense I liked horse racing because frankly I like anything to do with horses! The Kentucky Derby has always been a ‘life list’ item (side note: I created a life list because I want to focus on living, not dying.). This race brings together the top performing horses to demonstrate their power, grace, beauty and personality. It also is quite the social event! I turn 40 this fall. My husband asked me many times what I wanted or wanted to do to celebrate the milestone. After a few discussions, he decided we would splurge on a trip to Louisville to attend the Derby. I am ecstatic! And grateful to him, not just for spending the money, but also indulging in an activity that he normally would never think to do (this is one of those examples of doing for your spouse; sort of like our beer tasting adventures! I know we both will have a blast.). 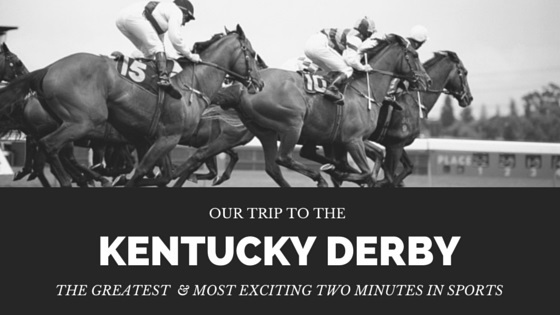 Not only will we be at the Kentucky Derby, we will also attend the Kentucky Oaks, which is held annually on the day before the Derby for three-year old fillies (female horses). Horses – This may be a “duh” word because why go to the Kentucky Derby and Oaks if it’s not to see the horses? Being anywhere near these majestic animals brings such joy and peace to my soul. Their personalities, beauty and strength inspire and wow me. The fillies and colts running in the Kentucky Oaks and Derby are among the top three-year old horses in the country, possibly the world. Jockeys & trainers – I have such admiration and respect for these people who devote their lives to horses, managing the many ups and downs I imagine this industry brings to their lives. Being a jockey takes so much talent, strength, courage and patience. Our package lets us meet several jockeys. I am thrilled to learn we’ll meet Steve Cauthen, who rode Affirmed to the Triple Crown victory in 1978 and is the last jockey to win the Triple Crown (he’s also the youngest jockey to win the Triple Crown), and Pat Day, one of the best jockeys who was inducted into the National Museum of Racing and Hall of Fame in 1991. Pat Day raced when I started following horse racing as a youth so I clearly remember him riding Easy Goer in the Triple Crown races. Easy Goer came in second to Sunday Silence (my favorite at the time) in the Derby and Preakness, then won the Belmont, stopping a Triple Crown victory. I used to tell people I wanted Pat Day to ride my racehorse so it will be exciting to meet him. The history – The Kentucky Derby began in 1875 and, along with the Oaks, has been run consecutively since at Churchill Downs in Louisville. Secretariat still holds the track record for running the 1 1/4 mile race in 1 minute 59 2/5 seconds in 1973 (a track record for 41 years!). As the first race in the Triple Crown series, the Kentucky Derby sets the stage for a possible Triple Crown win, although there hasn’t been a winner since Affirmed in 1978. Could you imagine if we watched the Kentucky Derby winner this year go on to claim the Preakness and Belmont too? People watching – the Kentucky Derby typically welcomes more than 150,000 people on the first Saturday of May. The infield tends to be more of a party, although the race can’t really be seen from there, hence our more expensive package because what’s the point of going to the Derby if you can’t watch the horses? Okay, that’s my opinion! We’ll be in the grandstand where there will also be good people-watching opportunities. From the outrageous hats to the glimpses of celebrities (I’m terrible at recognizing people out of context) to bow ties, I’m sure we’ll be entertained and amused throughout the two days! Traditions – From wearing hats to drinking mint juleps to singing “My Old Kentucky Home” before the race (Did you know The University of Louisville marching band has performed this almost every year since 1936? ), there are so many traditions surrounding this race. The Kentucky Derby bugle call by Steve Buttleman. A 40-pound blanket of roses, made of more than 450 red roses, is draped over the winning horse. 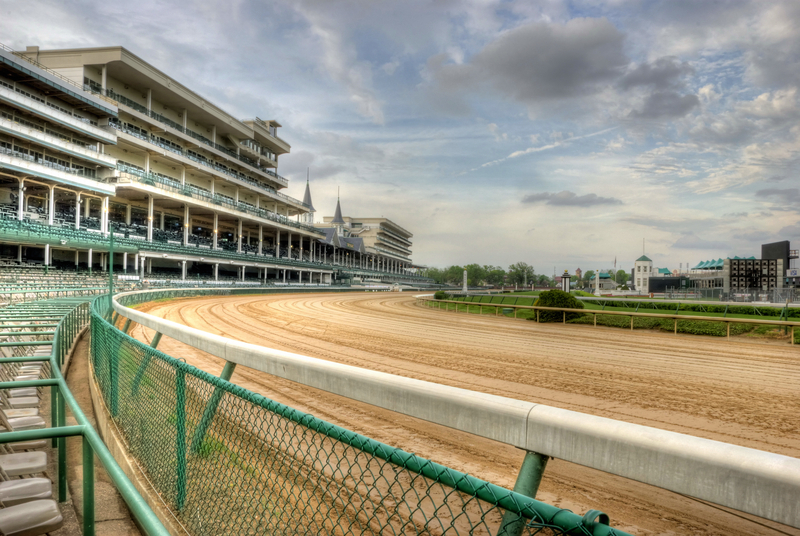 The racetrack, Churchill Downs, is rich in history too. The twin spires of the grandstand, constructed in 1875, are a beautiful monument that I can’t wait to see. Ladies – the Kentucky Oaks, known as the “Run for the Lilies,” started in 1875 for three-year old fillies. This race showcases the talent of these amazing fillies, often overlooked by the bigger and sometimes stronger boys in the Derby. There are no fillies in this year’s Kentucky Derby, but a female trainer, Carla Gaines, entered Bolo. Post parade – This is one of my favorite parts when watching on television so I can’t wait to be there in person as the horses take their first steps onto the track while “My Old Kentucky Home” is playing. So stay with me on this journey to Kentucky as I’ll bring you the horses, hats, people and fun.